Last week I did a post with information about the Mansfield family in my post Blogging from A to Z – S is for Sale. After preparing this post, I decided to do a little more research on the family. I had found a death entry for a Catherine Cross, with parents John Mansfield and Bridget O’Keefe. My ex-husband’s ancestors were John Mansfield and Mary O’Keefe. John Mansfield and Mary O’Keefe did have a daughter Catherine, but a glitch was that I had been told that their Catherine had married a man named William Eager (or Eagar). While I was working on the post, I thought that since the early Wills and Probate records for Victoria are available at the Public Record Office Victoria (PROV) website, I would check for a Probate file for John Mansfield, who died in 1882 at Clydebank (near Sale). I found his Probate file which provided me with information that confirmed that the death I had found was for their daughter, and also that she had been married to William Eagar. “That the said Will contained as the said deceased my late Father informed me “and as I verily believe a devise of Fifteen acres to my sister Catherine Cross then Catherine Eagar”. Although I had confirmed that Catherine had been married twice, and that the death record I had found was for her, and that the family information that she had married William Eagar was also correct, I still had more questions about the family. I decided before doing any more research on the family, that, since I was already on the PROV website, I would get John Mansfield (juniors) probate file. John never married, so I thought that he would have been more likely to have mentioned more family members in his will. Matthew 57, Catherine 55, Charles 53, John 52, Dora 50, Richard 48 and Thomas 45. Since none of these are listed as “deceased” it indicates that they were all alive in 1891 when Mary died. I now knew that in 1912, when John jr died, only the 3 daughters were still alive. I also know that there was at least one error on Mary’s death certificate, as daughter Mary is not listed. I had also found an immigration record for the family. They came to Australia on the “Gipsy Bride” in March 1857. This immigration list doesn’t mention Charles, but it did have daughter Mary. John doesn’t appear, although there is a Thos Mansfield age 40. Could he have been John’s brother? Or was this actually John? Did John and Charles travel on another ship? I have been unable to find an immigration record that would match either John or Charles. And who was the William Mansfield age 25 with them? He is listed as Mary’s son, but is the same age as daughter Catherine. Thomas Mansfield born 1851, christened 20 July 1854. There is also an entry for Catherine, which shows a birth date 27 December 1831 which is based on other date information. This entry includes the note that the church register page containing the record has not yet been imaged. I found a marriage record for Catherine Mansfield to William Eagar, on 29 March 1856 at Tralee. It would appear then that the William listed on the immigration list as Mary’s son was actually her son in law, William Eagar. Matthew Mansfield. According to mother’s death certificate born about 1834. No other information found for Matthew. Catherine Mansfield, possibly born 27 December 1831 at Tralee, Kerry, Ireland, married William Eagar on 29 March 1856 at Tralee. William was deceased by 1881, as Catherine became Catherine Cross about 1881. Catherine died in 1923 at Coburg, Victoria, Australia. Charles Mansfield christened 12 January 1840 at Tralee, died 5 July 1887 at the Gippsland Hospital in Sale, Victoria, Australia. He never married. Mary Ann Mansfield christened 5 May 1840 at Tralee. She married a man with the surname Farmer. John James Mansfield christened 27 November 1842 at Tralee. He died 20 September 1912 at Clydebank, Victoria, Australia. He never married. Dora Mansfield christened 31 March 1844 at Tralee. She married James Smith on 26 February 1873 at Nuntin, Victoria, Australia. She died 9 February 1913 at Sandringham. John Henry George Mansfield christened 25 June 1848 at Tralee. Probably died young. Richard Mansfield born Christmas 1848, christened 20 July 1854 at Tralee. There is a death entry in 1902 in Victoria, Australia that matches his age. Need to obtain the death certificate to see if this is for our Richard. Thomas Mansfield born in 1851, christened 20 July 1854 at Tralee. He married Susan Blyth and had 8 children. He died in 1889. I then obtained the death certificate for the Richard Mansfield who died in 1902. This death certificate didn’t provide any details about his parents, or any information about marriages or children. The only information provided was his birthplace, which was listed as New South Wales. Since there is a birth entry in the New South Wales for a Richard Mansfield that matches the age, it would appear that this death is not for our Richard. It is therefore not known what happened to our Richard after the family arrived in Australia. I have been unable to find a marriage entry for Catherine’s 2nd marriage, so I don’t know the given name of her second husband yet. I also haven’t been able to find a death entry for William Eagar. Tracing William and Catherine’s children may help in locating these records. Now that I had Mary’s married name, I was able to find her marriage. Mary Ann Mansfield married John Farmer in 1861. In searching for the Smith family at Valencia Creek for yesterday’s post Blogging from A to Z – V is for Valencia Creek, I found an article about Mary and John’s golden wedding. The article was quite long, and today when attempting to transcribe it, I found I hadn’t downloaded the full article, so I went back into Trove to download the 2nd part. When I did I found a second article, and since the first article was so long, I decided to just share the 2nd article. 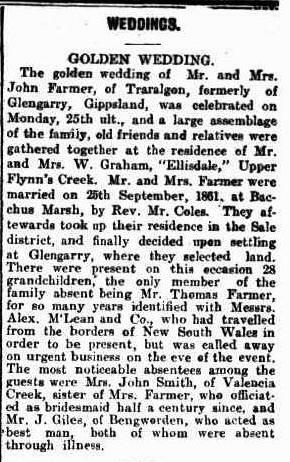 The golden wedding of Mr. and Mrs. John Farmer, of Traralgon, formerly of Glengarry, Gippsland, was celebrated on Monday, 25th ult., and a large assemblage of the family, old friends and relatives were gathered together at the residence of Mr. and Mrs. W. Graham, “Ellisdale,” Upper Flynn’s Creek. Mr. and Mrs. Farmer were married on 25th September, 1861, at Bacchus Marsh, by Rev. Mr. Coles. The afterwards took up their residence in the Sale district, and finally decided upon settling at Glengarry, where they selected land. There were present on this occasion 28 grandchildren; the only member of the family absent being Mr. Thomas Farmer, for so many years identified with Messrs. Alex. McLean and Co., who had travelled from the borders of New South Wales in order to be present, but was called away on urgent business on the eve of the event. The most noticeable absentees among the guests were Mrs. John Smith, of Valencia Creek, sister of Mrs. Farmer, who officiated as bridesmaid half a century since, and Mr. J. Giles, of Bengworden, who acted as best man, both of whom were absent through illness. This article shows that John Farmer and Mary Ann Mansfield were married 25 September 1861, at Bacchus Marsh. Next week, I’ll share what I have found in my search for Catherine’s children.